Hi, I’m Michelle! My husband’s in the military and we’re moving to Germany. I’ve contemplated for a while the best way of sharing our journey over the next 2-3 years with friends and family and decided that facebook would be incredibly annoying to those that didn’t want to see us gallivanting around Europe, so a blog it is! It will also include the day to day struggles of learning a new culture and language, a wife with a PhD in microbiology finding a job on the German economy, keeping our crazy dog in check, and fun DIY projects that I copycat to make our German house a home. I hope that it will keep us closer by giving you a peek into our life while we’re absent from the states. You can follow my blog by entering your email into the "subscribe" box, download the app Bloglovin' and search for my blog (Good luck spelling it correctly), or like my Facebook page. Bis zum nächsten Mal. Glad you found it! I hope your move goes well. Let me know if you have any questions. Hi Michelle! I just found your blog on Bloglovin. 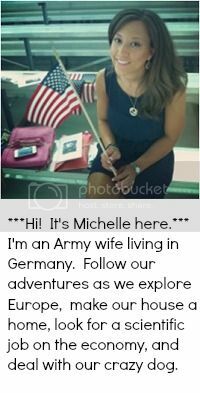 I'm an Air Force wife, also in Germany. I also love to DIY and I haven't figured out how to do it on the economy yet. Can't wait to read about your travels!